The Las Vegas Valley is called home by over 2 million residents, and the area continues to be one of the fastest growing communities in the United States. 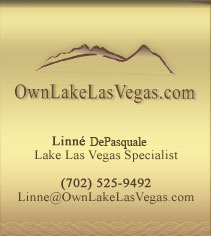 Lake Las Vegas Resort is nestled in the sculped lava mountains of east Henderson, a mere 17 miles from the famous Las Vegas Strip. The residents of our community enjoy a sheer freedom and unfettered lifestyle, unique to our city and unlike any other in the world. Whether you are looking for world-class dining, a nightlife that never ends, or Broadway-caliber shows, the City of Entertainment has it all and much more. For those looking for excitement outside the big city, the Las Vegas Valley shares an outdoorsman's spirit, rivaled by few others. Lake Mead National Recreation Area offers a wealth of things to do and places to go year-round. Its huge lakes cater to boaters, swimmers, sunbathers, and fishermen while its desert rewards hikers, wildlife photographers, and roadside sightseers. Three of America's four desert ecosystems--the Mojave, the Great Basin, and the Sonoran Deserts--meet in Lake Mead National Recreation Area. As a result, this seemingly barren area contains a surprising variety of plants and animals, some of which may be found nowhere else in the world. Wetlands Park is a habitat for numerous species of wildlife and an essential step toward cleaner water in Southern Nevada. Click here to view images of birds and wildlife that have visited the Wetlands. The Duck Creek Trailhead begins at Broadbent and ends at the Wetlands Nature Preserve. It is just over ½ mile in length. Visitors can also access the ½ mile coyote Loop and the Quail Run Loop from the main Duck Creek Trail. The Preserve is home to thousands of migratory waterfowl as well as numerous resident desert birds. There are nine ponds available for birding, surrounded by both paved and soft surfaces. You can expect to do a lot of walking and allow yourself adequate time to visit the area. It is also recommended that you wear appropriate clothing and comfortable, sturdy shoes. Bring water, a hat, and wear sunscreen. If you do not have binoculars, The Preserve has some available for loan. Hoover Dam is not only one of the Modern Wonders of the World; it is also one of the twentieth century's greatest engineering achievements. Its sheer size is one of the best reasons to go see it. It is built from over 6 million tons of concrete, enough to pave a highway 15 feet wide stretching from San Francisco to New York City. There is a guided tour available, but not necessary to visit the Dam. Boulder City is the original Dam Town, hosting many of the workers and families responsible for building the depression-era project. The quaint town is nearly adjacent to Hoover Dam, and is a fabulous place to stop for lunch before or after your visit. Beat the Heat at almost 12,000 Feet! The temperature is usually about twenty degrees cooler here than it is on the desert floor. Mt. Charleston is about 35 miles northwest of the Las Vegas Strip, and features loads of recreational fun. There are seven campgrounds with more than 180 campsites and about 160 picnic sites. There are also fifty-three miles of trails that crisscross the mountains, varying in length and difficulty. You can even take a horseback ride that goes through Fletcher Canyon. Wear a hat and sunscreen, and be sure to bring your binoculars so you can do some bird watching. There is a recently remodeled Mt. Charleston Lodge for refreshments and remarkable atmosphere. The Great Unconformity is a geologic feature where two adjacent layers of rock were not formed one after another in the earth's development. At Frenchman Mountain in Southern Nevada, there is a gap of about 1.2 billion years where the rock jumps from 500 million years old to 1.7 billion years old. In the Grand Canyon, the clearly visible related discontinuity represents a time gap that varies from about 250 million years to 1.2 billion years. The Great Unconformity's missing 1.2 billion years represents about 25% of the earth's history. As a distant juxtaposition to the blackjack tables, the Las Vegas Valley offers some of the most beautiful rockscapes in the world. Hop into a vehicle and head out to Red Rock Canyon to explore and discover. Red Rock Canyon is well under an hour's drive west of Las Vegas and showcases many significant geologic features. The area is a great place to kick back and enjoy nature's wonders. Hiking, biking, and driving trails are open to the public daily. Valley of Fire State Park is located only six miles from Lake Mead and 55 miles northeast of Las Vegas via Interstate 15. The Valley of Fire derives its name from red sandstone formations, formed from great shifting sand dunes during the age of dinosaurs, 150 million years ago. Complex uplifting and faulting of the region, followed by extensive erosion, have created the present landscape. Ancient trees and early man are represented throughout the park by areas of petrified wood and 3,000 year-old Indian petroglyph. Popular activities include camping, hiking, picnicking and photography. The park offers a full-scale visitor center with extensive interpretive displays.